Home » Herrick Chapman - "France’s Long Reconstruction: In Search of the Modern Republic"
Herrick Chapman - "France’s Long Reconstruction: In Search of the Modern Republic"
Historian Herrick Chapman explores how the French, in reconstructing their country after World War II, sought to combine a top-down modernization drive with a rejuvenation of democracy. Just what form this new France should take remained the burning question at the central of political combat until the end of the Algerian war. 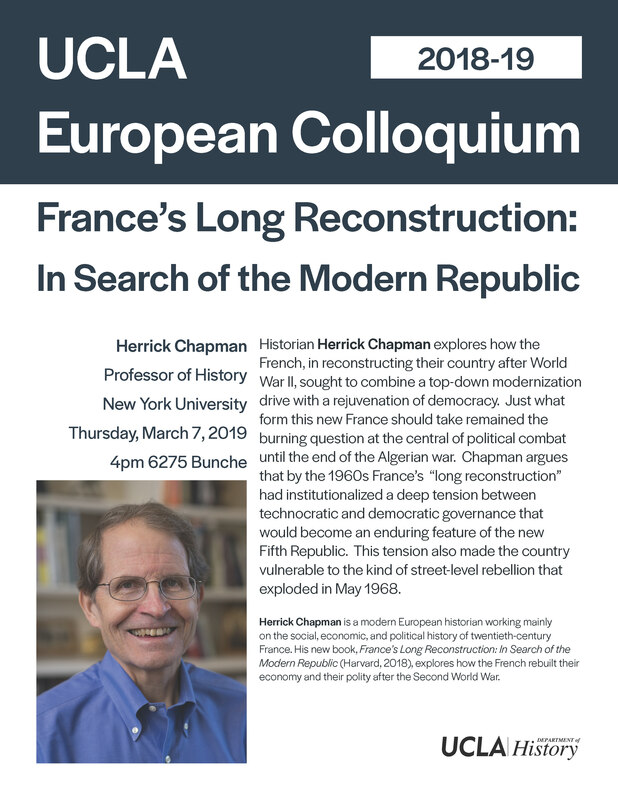 Chapman argues that by the 1960s France’s “long reconstruction” had institutionalized a deep tension between technocratic and democratic governance that would become an enduring feature of the new Fifth Republic. This tension also made the country vulnerable to the kind of street-level rebellion that exploded in May 1968. Herrick Chapman is a modern European historian working mainly on the social, economic, and political history of twentieth-century France. His new book, France’s Long Reconstruction: In Search of the Modern Republic (Harvard, 2018), explores how the French rebuilt their economy and their polity after the Second World War.